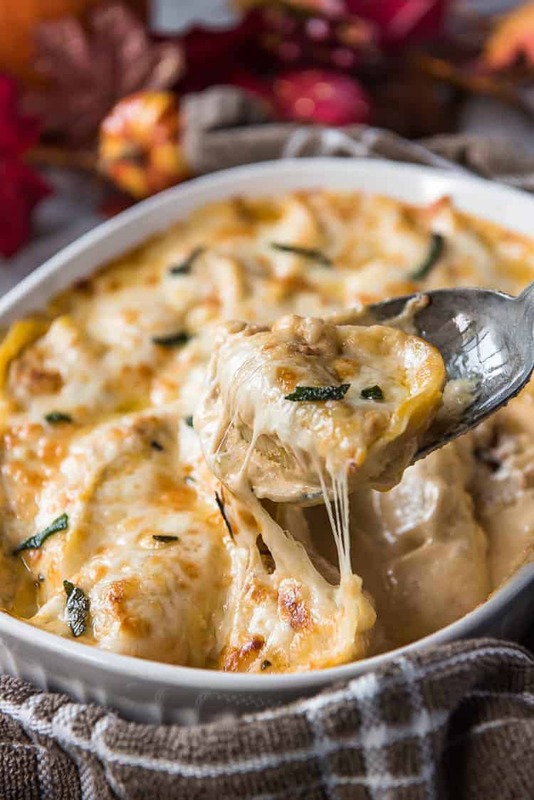 These creamy, cheesy Pumpkin Alfredo Stuffed Shells are super easy and a surprising crowd-pleaser! 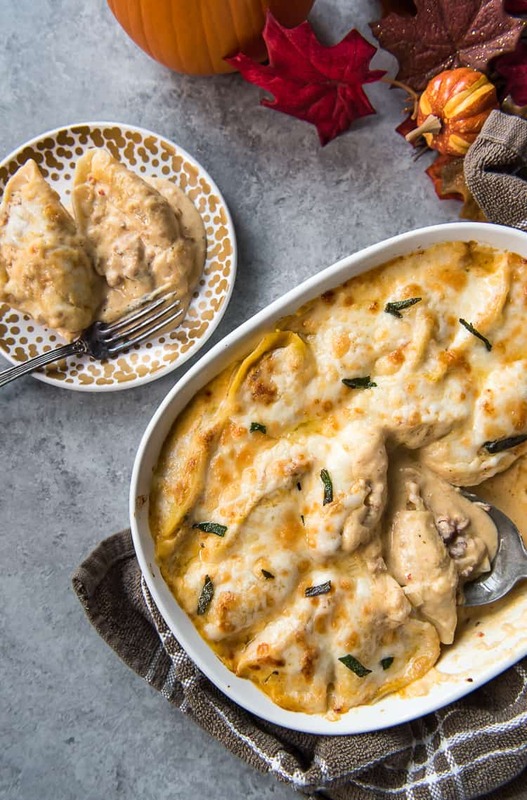 Jumbo pasta shells, stuffed with sausage, onions, and ricotta cheeses, are covered in a smooth pumpkin alfredo sauce that gives this dinner an extra special flavor. This pumpkin dish is a gateway, friends. Seriously. If there’s someone in your life who’s anti-pumpkin, this is the way to ease them into the world of gourds. My husband is my case study. 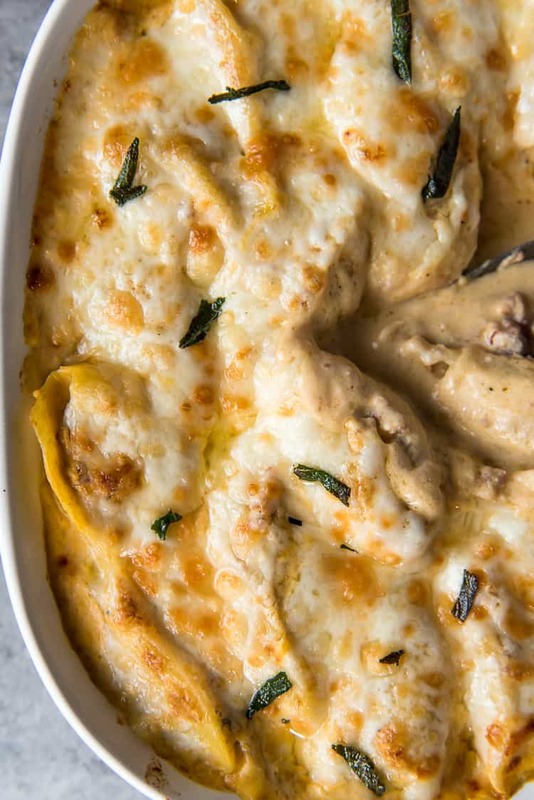 JUST TAKE ME TO THE PUMPKIN ALFREDO STUFFED SHELLS ALREADY! 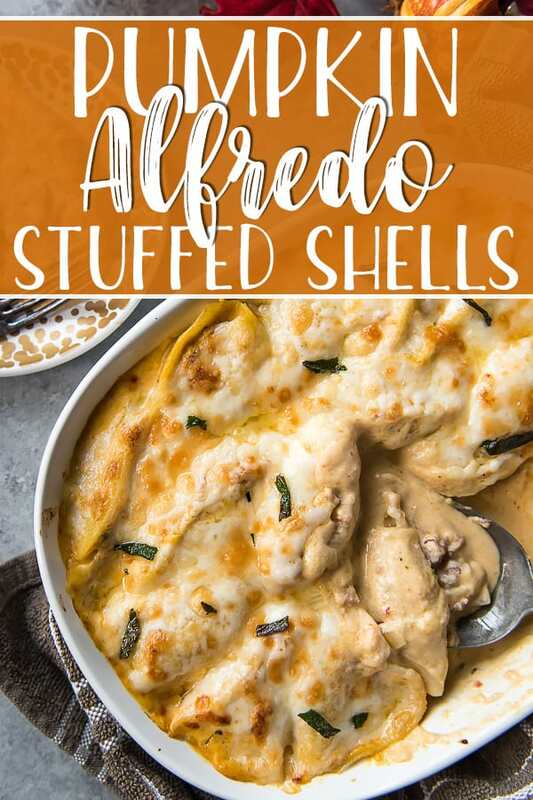 If you’d rather skip my (pretty darn helpful) tips and tricks, essential cooking info, and similar recipe ideas – and get straight to this deliciously easy stuffed shells recipe, just scroll right on down to the bottom of the page where you can find the printable recipe card! To be fair, Abe doesn’t hate pumpkin. Given the option, though, he would pretty much choose any other flavor. For him, it’s the spice. That glorious cinnamon-clove-ginger combo that makes any pumpkin recipe sing! There’s no pumpkin spice in this recipe, which I’d imagine is the reason he actually truly enjoyed it. 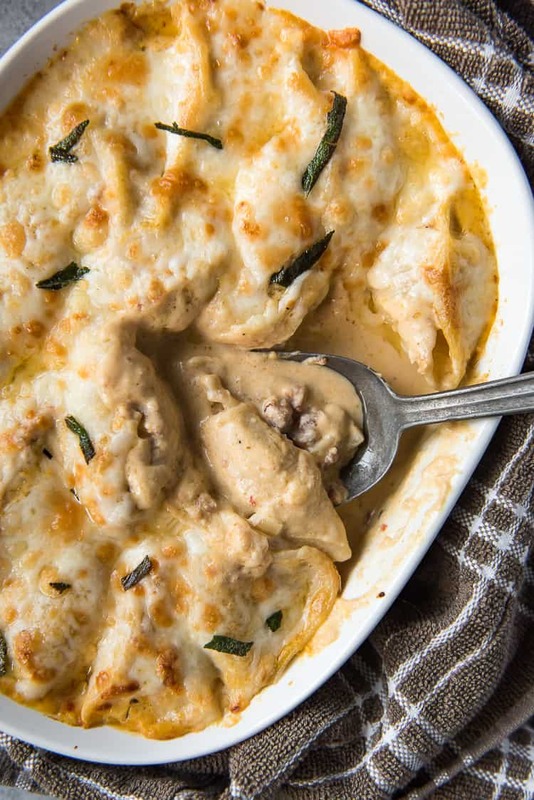 These stuffed shells are fairly classic – sausage, onion, sage, ricotta. The alfredo sauce is cooked with a cup of pumpkin puree, which gives it a very subtle yet very seasonal taste. Then I threw some fried sage on top because why the hell not? How Many Stuffed Shells Per Person? The number of servings in this dish can vary depending on if it’s the main dish or an addition. As a main dish, 3-5 shells per person would be ideal, depending on appetites. You could stretch the total servings out to 7 or 8 by serving it with garlic bread, a salad, or soup. 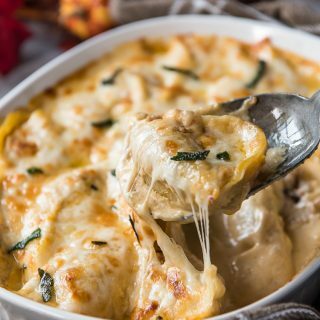 What To Serve With Pumpkin Alfredo Stuffed Shells? Can Stuffed Shells Be Made Ahead? Yes, stuffed shells can be made ahead of time! Prep the recipe all the way up to the baking step, then cover the dish with foil and refrigerate for up to 1 day. If you’re planning to freeze the shells, after stuffing them, place them on a baking sheet, cover, and freeze for at least 2 hours. Once they’re frozen, transfer them to a zipper bag. You can also freeze them in the casserole dish, covered with the alfredo sauce. Wrap the dish with plastic wrap, then foil, and freeze for up to 3 months. First, boil the pasta shells until al dente, about 10 minutes. Drain & rinse, then set aside. While the shells are boiling, brown sausage, onion, and garlic in a skillet. Combine the mixture in a large bowl with ricotta cheese and fried sage. Next, make the pumpkin alfredo sauce. Melt butter in a saucepan, then stir in pumpkin puree, half-and-half, Parmesan cheese, and nutmeg. Whisk continuously until everything is melted and well combined, then allow the sauce to simmer until it thickens. Spread 1/2 cup of the sauce on the bottom of a casserole dish. Then, stuff your shells. Fill each shell with heaping spoonfuls of the ricotta-sausage mixture. Place them in a single layer in the casserole dish. Pour the remaining sauce evenly over the top of the shells, then spread on the mozzarella and Parmesan cheeses. Finally, it’s baking time! Cover the dish with foil and bake at 375 for 20 minutes. Turn on the broiler to high, remove the foil, and allow the cheese to brown slightly for 2-3 minutes. Before serving, garnish with remaining fried sage if desired. Bring a large pot of salted water to a rolling boil. Add the jumbo shells and boil for 9-10 minutes until slightly al dente. Drain the shells and rinse under cold water, then set aside. Melt 2 tablespoons butter in a large skillet over medium heat. Place the sage in the skillet and fry for 30-45 seconds on each side. Transfer fried sage to a paper towel to drain. Add the sausage, onion, and garlic to the skillet and cook until browned, about 5 minutes. Remove from heat and allow to cool. Preheat oven to 375 degrees F. Butter or spray a casserole dish and set aside. Melt remaining butter in a medium saucepan over medium heat. When butter is melted, stir in pumpkin puree, half-and-half, 1/2 cup Parmesan cheese, and nutmeg. Stir continuously until cheese is melted and sauce is combined and smooth, 3-4 minutes. Continue to simmer until sauce thickens slightly, another 3 minutes, stirring occasionally. Add a few tablespoons of pasta water if needed to thin out the sauce if it thickens too much. Remove from heat. 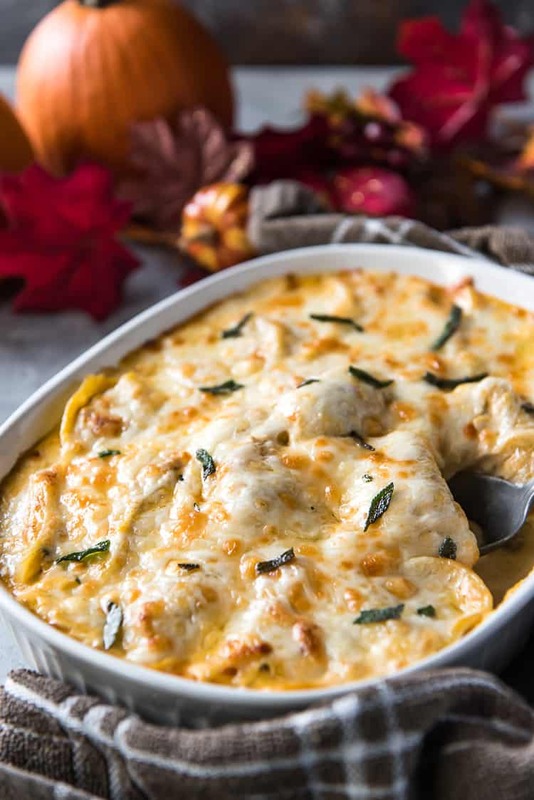 Spread 1/2 cup of the pumpkin alfredo sauce on the bottom of the casserole dish. In large bowl, combine the ricotta cheese and cooked sausage mixture. Crumble half of the fried sage into the mixture and stir well. Fill each pasta shell with heaping spoonfuls of the mixture, then set them open side up on top of the sauce in the casserole dish. Pour remaining sauce evenly over the shells. Sprinkle the mozzarella and remaining Parmesan over the shells. Cover the dish with aluminum foil and bake for 20 minutes, until the cheese is melted and shells are warmed through. Remove from the oven and remove the foil. Turn the broiler on and broil on high for 2-3 minutes, until cheese begins to bubble and brown. Garnish with remaining fried sage and serve warm. PIN THIS STUFFED SHELLS RECIPE FOR LATER! 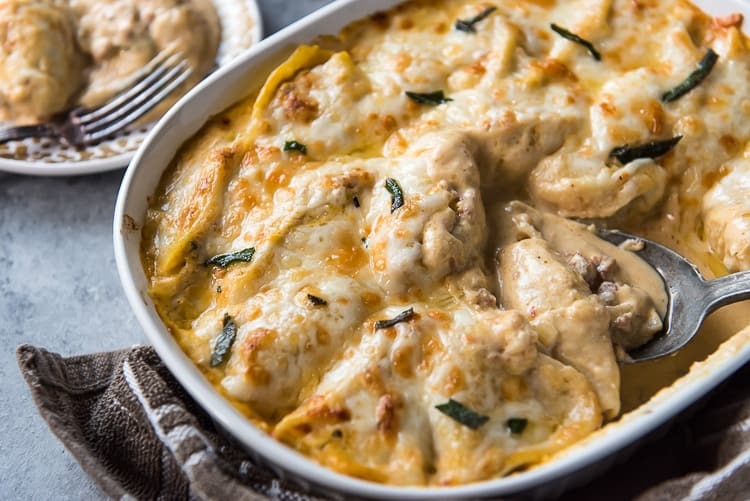 This looks so creamy! I’m loving all the pumpkin recipes! No wonder your husband liked it. It looks amazing.